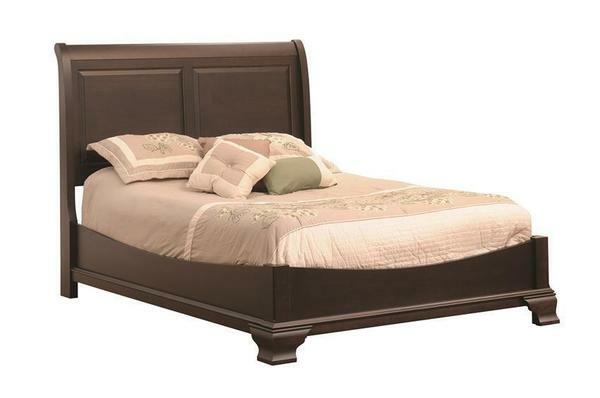 The Amish Walton Hills Sleigh Bed is an exquisite piece of bedroom furniture. This handcrafted solid wood is sure to be a statement piece in your bedroom. Customize your bed by choosing the wood type, such as Oak wood, Cherry wood, Brown Maple wood and several other kinds of wood. Also, complete the bed by picking your finish to match your existing bedroom furniture. Please contact one of Amish Furniture Specialists with any questions or if you need help in the order process at 866-272-6773. Floor to Top of Side Rails: 16 1/2"
Floor to Bottom of Side Rails: 4"